The topic of austerity became something of a web sensation, and was named the word of the year by Merriam-Webster online dictionary in 2010 because of the number of web searches this word generated that year. News articles on the Net and elsewhere have brought the idea of forced austerity into the mainstream causing many people to wonder what austerity is, which is likely because they haven’t experienced directly applying it themselves, or even heard about it being practiced by others—and certainly not in a religious sense of the word. In fact, as one might expect in a capitalist dominated world, in popular usage, the word is defined primarily, even solely, in terms of economic policy. According to Wikipedia, “In economics, austerity is a policy of deficit-cutting, lower spending, and a reduction in the amount of benefits and public services provided. Austerity policies are often used by governments to reduce their deficit spending while sometimes coupled with increases in taxes to pay back creditors to reduce debt.” In light of this one sided use of the word, I thought it would be interesting to look at a more spiritual perspective, since it is an important word in Eastern spiritual circles, and found throughout Prabhupada’s writings. In other dictionaries I didn’t find much help in looking up austerity, as is was defined as “the quality of state of being austere. So I had to look up austere to see how the word is generally used. 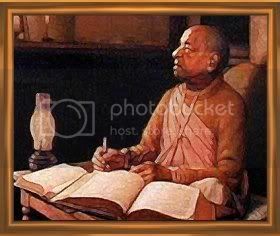 The usual definitions of the word I found in the Merriam-Webster online dictionary, don’t give the meaning as used in a Vedic or spiritual sense throughout Prabhupada’s writings. Yet for comparison sake here are the meanings I found: 1) a : stern and cold in appearance or manner b : somber, grave , 2) : morally strict : ascetic, 3) : markedly simple or unadorned , 4) : giving little or no scope for pleasure . Does it sound like something you would like to do? Probably not. Who would want to practice voluntary austerity? What about forced being forced to live an austere life? Could there be any benefit in any type of austere living? For example, in current economic times, is there any advantage to having to reduce spending or in being thrifty? Or what about losing one’s freedom while being held hostage? Although most people would not pray for either possibility, if we study those who have experienced forced thrift, restricted freedom, or the increased possibility of death, there are surprising benefits which are possible. In the first case, when spending must be limited or curtailed, many people naturally contemplate what is really of value in their lives. Going against the values of consumerism, a common discovery is that true value in life does not come from possessions or money, but through their family relationships, and facilities like having time, and freedom. Those are certainly good realizations. However, in the second case of forced austerity, there can even be more benefit, especially spiritually. Any circumstance where a person’s life is threatened or their freedom is reduced can have the effect of bringing about deep thought about the purpose of life, it’s meaning, the pondering of death, and the existence of God. (Being in prison is another example of forced austerity.) When there is limited external stimulation (or distractions), coupled with the increased possibility of death, existential introspection seems to be a natural consequence. These last effects give us a clue about why voluntary austerity is considered the wealth of the brahmanas. Prabhupada taught the idea of simple living and high thinking. We find that by simple or uncomplicated, unstressful living, existential inquisitiveness or “high” spiritual thinking is often fostered. One Sanskrit word used for austerity is tapasya and is used frequently in the Gita and other Vedic texts. Penance is often used conjointly or sometimes synonymously with austerity. Tapasya means voluntary acceptance of some material trouble for progress in spiritual life. There are many recommendations for spiritual life given in the Vedas, such as rising early, internal and external cleanliness, giving up the eating of meat and intoxications, fasting on special days, studying Vedic literature, and chanting Vedic hymns and prayers. Such activities may be materially troublesome, yet they are helpful for spiritual advancement, and those interested in such advancement gladly embrace them. There are three consecutive verses in the Gita which delineate austerity of the body, speech, and the mind. They are considered in the mode or quality of goodness, and thus favorable for the practice of spiritual life. We can consider these verses as outlining favorable practices for a spiritually balanced life. And finally, austerity is considered one of the four principles of religion given in the Shrimad Bhagavatam. They consist of austerity, cleanliness, mercy and truthfulness. Although these principles can be considered as corollary factors which support the most important practices of bhakti, like engaging in the nine kinds of devotional service beginning with hearing, chanting and remembering Krishna, they are very essential principles which promote a pure lifestyle. Although sometimes Prabhupada would say that human life is meant for austerity, on the path of bhakti we don’t engage in greatly difficult and austere practices like the traditional yogis do. From our perspective such austerities can make the heart hard, while bhakti is about softening the heart through loving for Krishna. Our austerity is the natural austerity which comes in relationship to service to Krishna. For example, eating (or honoring) prasadam or sanctified vegetarian food, although enjoyable, is also an austerity, as one doesn’t eat food that can’t be offered to Krishna. Once we become attracted to Krishna and center our life on his service, many activities fall away that we used to think nothing about doing. Some would call this austere, but for a devotee it become a source of joy. Such natural austerities help us fix our minds and hearts on Krishna and make spiritual progress.